Around the world with over a dozen food allergies, and she's just getting started. Allie Bahn is the voice of Miss Allergic Reactor, a blog all about living life fully with food allergies. 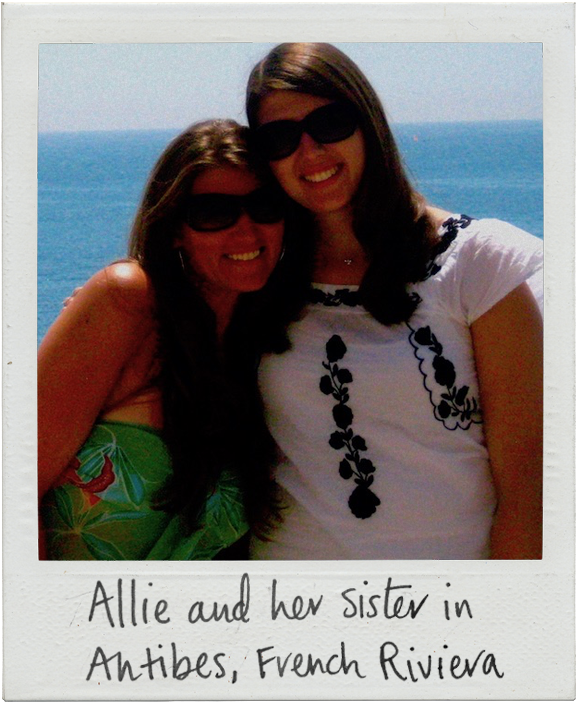 As a world traveler, writer and teacher, Allie pours her passion into helping others build a food allergy support system based on self-advocacy. We were able to catch Allie in between adventures, and get some of her best tips on traveling, eating out and constantly growing with food allergies. It all started in 2008 after I finished an independent study on kids with food allergies. I attended a food allergy conference, and met so many parents and kids who were living in fear. They were blown away by all the places I'd gone and the life I had, which gave me the idea for Miss Allergic Reactor. Putting my passion for traveling, writing and food allergy advocacy all together in a blog was my way of making a difference for those living with food allergies. What is the meaning behind the name, Miss Allergic Reactor? An Allergic Reactor is someone who “reacts” to their allergies by advocating for themselves. They are the ones who stay safe while doing everything they want to do without allowing allergies to get in the way. It's how I have successfully lived my life with allergies, which is why I know others can too! How did your journey with food allergies start? I have always had food allergies. I'm allergic to peanuts, all tree nuts, fish, shellfish, banana, kiwi, mango, olives (olive oil is okay), legumes and potatoes. My dad has a nut allergy, and my mom is a nurse, so they were really able to support me. It was never a "no" from them — it was always about navigating a way to make things happen. Growing up, I didn’t know anyone else with severe food allergies, but I had a great support system and learned early on how important it is to build strong and positive connections. We all need people to watch out for us without making us stand out, whether they are neighbors, classmates or friends. I try to surround myself with people who get my food allergies but don't make them the center of attention. They will never know how much it means to people with allergies. Can you name all the countries you've traveled to? Mamma mia! There are so many! I don't usually keep count because, to me, it is about the experience, not how many places I have been. I think this is a pretty complete list though: many parts of the U.S., Canada, all over Europe including France, the U.K. and Scotland, Italy (lived in Trieste for three years), Spain, Ireland, Belgium, Netherlands, Croatia, Slovenia, Czech Republic, Monaco, San Marino, Austria, Switzerland, Turkey (lived in Istanbul), Cyprus, Portugal, Slovakia, Iceland, Israel, Australia (lived there and have traveled multiple times to almost all inhabitable areas), New Zealand and Argentina. Other than auto-injectors, what are a few things you never travel without? Having chef cards is so essential because people take your allergies more seriously, and it makes it easier with multiple allergies. I'm pretty particular about what I want to include, so I make my own. There are free templates online, but it’s nice to be explicit — for example, there are anchovies in Worcestershire sauce, so I put that on the list of things for the chefs to watch out for. I also bring plenty of snacks when I travel. What was is like living in Italy with food allergies? I knew I wanted to teach internationally and got a job placement in Trieste, about 1.5 hours north of Venice. I'd never taken Italian before so I learned everything by immersion. I cooked a lot at home and still remember the first time I went to the grocery store for ingredients. It took forever, but it definitely helped me learn parts of the language quickly! Food is such a significant part of Italian culture. They want you to enjoy the experience, so they do everything they can to help you. I went to restaurants where they called the actual baker to ask about ingredients. No one ever told me I couldn’t eat there. How do you prepare for traveling to a new country? I do a lot of online research about the local food, the most common ingredients and if my allergens are prevalent. Then, I typically book an apartment with a kitchen so I can have the option to get fresh food and cook at home. Ultimately, traveling is about being flexible and adaptable. I love living abroad and getting new cultural experiences, so it's always worth it to me to figure out how to navigate safely. One summer, when I was traveling with my family in southern France, we went to this amazing local restaurant in Cannes, Cote Jardin, and they were incredible with my allergies. I was able to eat something for each course including dessert, which never happens. It was a magical night for me and food! Tips for eating out with food allergies? Eating out is about being flexible. I love trying new things, so the best is when I can go to a restaurant, explain my food allergies and they suggest something that works for me. Be adventurous, but in a safe way. Living in Massachusetts, there are so many food allergy-friendly options, which has changed so much since I was a kid. It was normal to regularly get turned down. But, in 2009, a law passed that requires restaurants to label the bottom of the menu and train the staff about food allergies. Most places are now able and willing to work it out to make you something safe. Any memorable hotels you've stayed at? Last year, my sister and I spontaneously booked a trip to Chicago and stayed at the Radisson Blue Aqua Hotel. They gave us an environmentally allergy-friendly room with an air purifier and hardwood floors. It was great! Definitely 88 Acres bars. I almost always have one in my bag. I also love their seed butters. I bring fresh fruit, veggies or a yogurt with me on the go — Siggi's is the best with high protein and unique flavors. Are there any apartment or home rental services you prefer to use when traveling? Airbnb, HomeAway and VRBO — I tend to be a last-minute traveler, so it usually just depends on what has more availability. I've had great experiences using all of these! Some of your favorite restaurants you've recommended on Spokin? A few of my local faves are The Tipping Cow and Highland Kitchen in Somerville, MA. I also really like Mission Taqueria. I love that I can share hidden allergens that I discover in restaurants on the Spokin app – I think that is a life-saving feature! When you cook, where do you find your recipes? My nana was an amazing cook. I use her recipes sometimes. My mom is also incredible, and she teaches me her recipes too. I gravitate towards Italian cooking and have a few cookbooks from Italy that I use. I love the simplicity of ingredients. Giada De Laurentiis's Everyday Italian is great! Any places on your travel wishlist? I have always wanted to go on a safari in Africa! There are endless places! I love learning about new cultures and really experiencing them. I'm more apt to spend time talking to locals, immersing myself and asking where they spend their time instead of visiting tourist sites — although those are also important. I am headed to Oslo, Norway and then to Italy for a wedding. I've never been before and thought, "Why not?"